Our Signal TS-SC00's are Mono Y guitar cables that go from 2 1/4" stereo plugs (ts) to 1 1/4" mono plugs (ts). 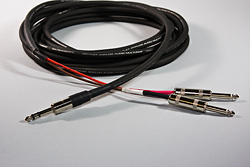 This cable will allow you to plug both outputs of your dual output guitar into one amp or preamp with one cable. This cable is designed to plug into inputs that are less than 2 feet apart. Great cable for guitar or bass with separate outputs for pickups on the guitar.